The version of The Lion King at Mandalay Bay is the full unabridged version of the show and runs almost exactly two and one half hours, complete with an intermission, a rarity for Vegas entertainment. The show starts off playing to its strengths, as all the animals in the show parade down the aisles and up to the stage. The costumes that the actors wear in the show are both dazzling in appearance and stunning in their creativity. Calling them “costumes” hardly does justice to the ensembles. Marija Juliette Abney, Jeremiah Tatum, and Derrick Spear in the opening number “The Circle of Life” from THE LION KING Las Vegas. ©2009, Disney. Photo Credit: Joan Marcus. Julie Taymor the director of Costume Design as well as Mask and Puppet Design describes her high-level objectives on the Lion King costumes. I wanted audiences to take a leap of faith and imagination right from the start. Stage mechanics would be visible, the audience, given the hint or suggestion of an idea, would be ready to fill in the lines, to take it the rest of the way. The fact that there is some transparency in the costume design strengthens the audience involvement, in that it requires extra intellectual engagement, rather than a completely passive experience, that is so common in mass market entertainment. After watching “The Lion King” you might wonder how long it took to design all the costumes and masks, the answer is: Over 34,000 hours. The lighting for Mufasa’s ghost was difficult to conceptualize, yet relatively easy to achieve technically. We eliminated all ambient light onstage, projected overlapping images of crispy focused dots of light and sculpted the mask with sidelights. The effect we wanted was that of entering the silence and vastness of the cosmos – or of the internal world of Simba’s subconscious. The Lion King story should be familiar to anyone that has been a child, a parent, or a grandparent in the last fifteen years, as the show is based on the hugely successful 1994 Disney movie of the same name. The Musical opened three years later on Broadway, and has since expanded to seemingly every corner of the globe. The plot line of ”The Lion King” is vaguely similar to Shakespeare’s Hamlet with Disney modifications, hence there is much less bloodshed and you have the lighthearted “Hakunna Matata” song substituting for Hamlet’s Soliloquy. Like most Musicals, the plot line is of secondary importance, unlike most Musicals the music also takes a secondary role to the costumes and staging. The music by Elton John and lyrics by Tim Rice with African Choral music supplied by Lebo M, is serviceable with few numbers you’ll be humming after the show. Particularly effective are the two percussionists positioned in the audience balcony both stage left and right, with congas, shakers and koto drums, creating a wonderful stereo effect. Gee aren’t those little pishers cute, they’ve remembered their lines, have hit their marks, they even sing and dance! Needless to say, that suggests I wasn’t fully engaged in the first act of the show. The Internet Buzz supports my impression that the second act of the show is the stronger of the two acts. The first act ends strong with one of the best scenes in the show, with the singing of “Hakuan Matata” and introducing the most Disneyesque characters in the show Timon (A Meekat) and Pumbaa (A Warthog). The Wildebeest Stampede is another show-stopper, Taymor pulled out all her tricks to create an amazingly real stampede effect, right before you eyes. My neighbors in the audience have all seen other productions of “The Lion King” and unanimously agreed that the production at Mandalay Bay was the cream of the lot. 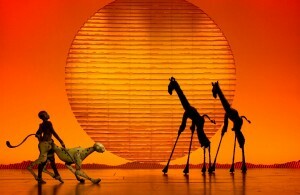 If you want to see a great show in Vegas put “The Lion King” on your list. 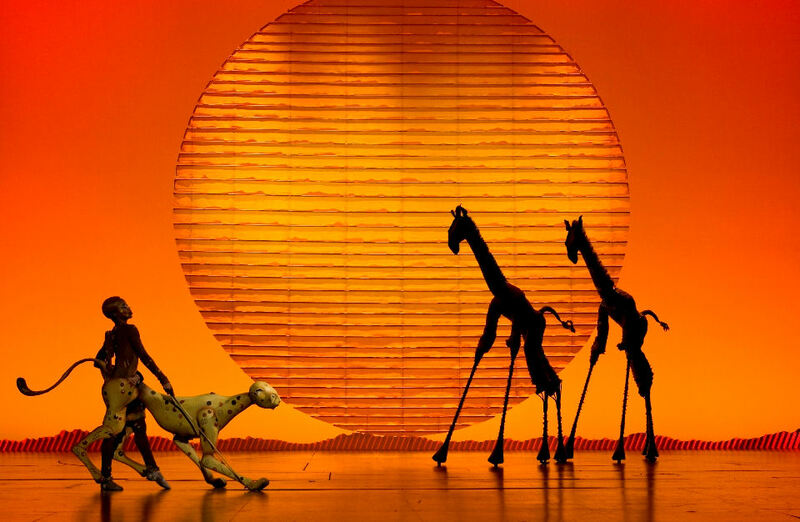 If you want to see “The Lion King” but are not sure which production to see, the one at Mandalay Bay should be at the top of your list. If you want to see “The Lion king” at Mandalay Bay, act with haste, as the production will be ending its run on December 30 1011. There are conflicting rumors as to why such a popular show is stopping after a mere two and one half year run. Rita Rudner believes it is because “The Lion wants to spend more time with his family” Others believe it is to make room for the up-coming Michael Jackson themed Cirque du Soleil show. As a side note, Las Vegas showrooms are ill-equipped to handle shows with intermissions, in that you can expect to find very long lines in the restrooms, for both men and women, so plan accordingly, a casino restroom is probably your best bet.